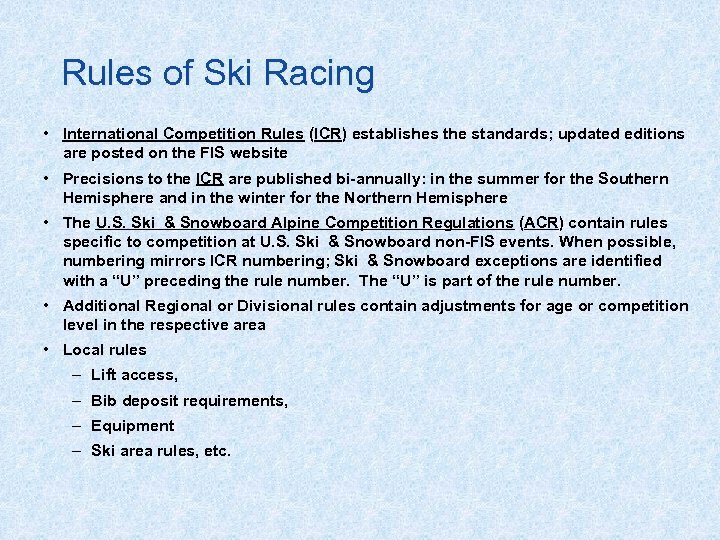 Rules of Ski Racing • International Competition Rules (ICR) establishes the standards; updated editions are posted on the FIS website • Precisions to the ICR are published bi-annually: in the summer for the Southern Hemisphere and in the winter for the Northern Hemisphere • The U. S. Ski & Snowboard Alpine Competition Regulations (ACR) contain rules specific to competition at U. S. Ski & Snowboard non-FIS events. 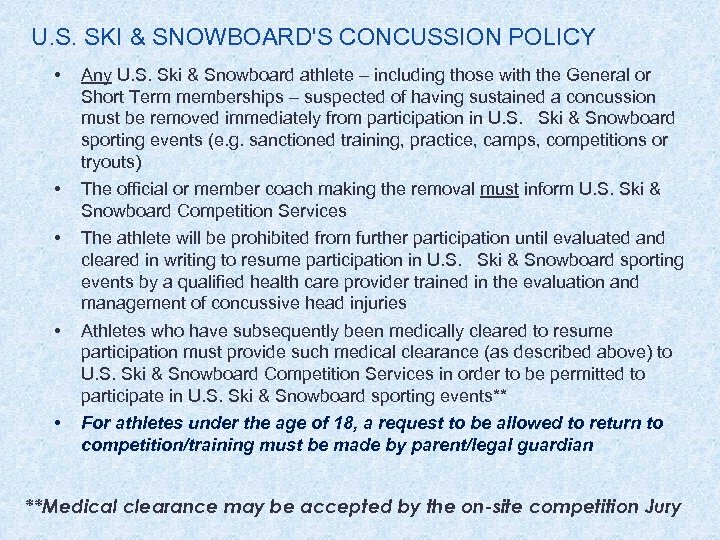 When possible, numbering mirrors ICR numbering; Ski & Snowboard exceptions are identified with a “U” preceding the rule number. 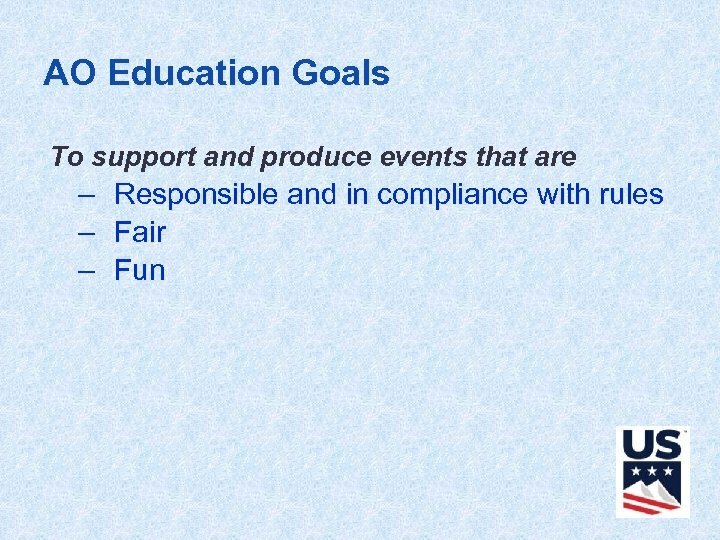 The “U” is part of the rule number. 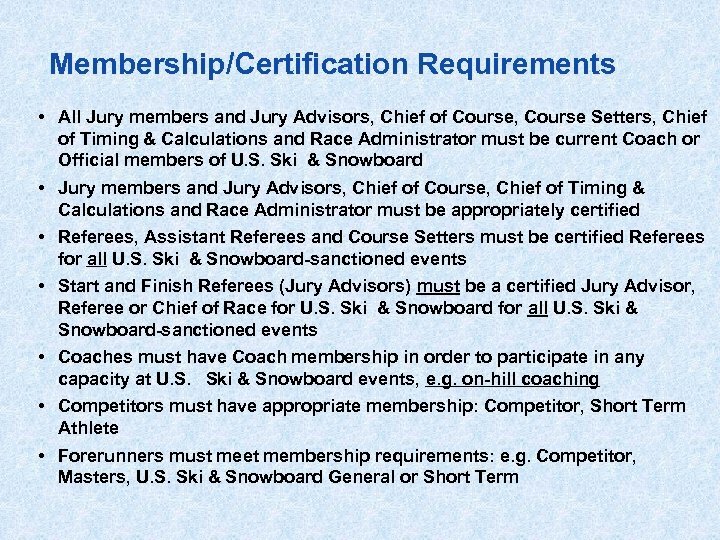 • Additional Regional or Divisional rules contain adjustments for age or competition level in the respective area • Local rules – Lift access, – Bib deposit requirements, – Equipment – Ski area rules, etc. 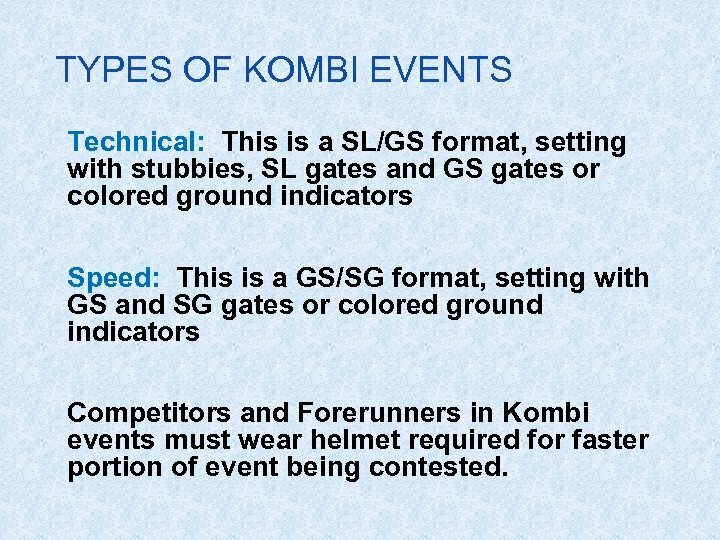 TYPES OF KOMBI EVENTS Technical: This is a SL/GS format, setting with stubbies, SL gates and GS gates or colored ground indicators Speed: This is a GS/SG format, setting with GS and SG gates or colored ground indicators Competitors and Forerunners in Kombi events must wear helmet required for faster portion of event being contested. 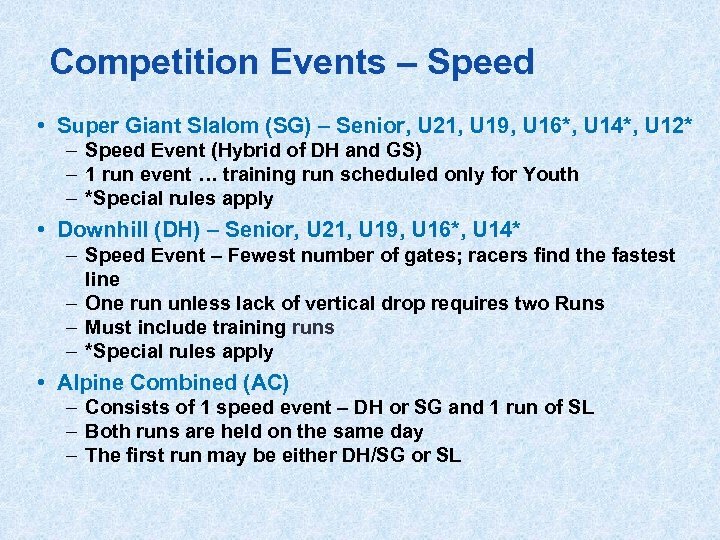 DUAL - PARALLELS / PARALLELS Dual - Parallels can be staged using either Giant Slalom (GS) or Slalom (SL) format. 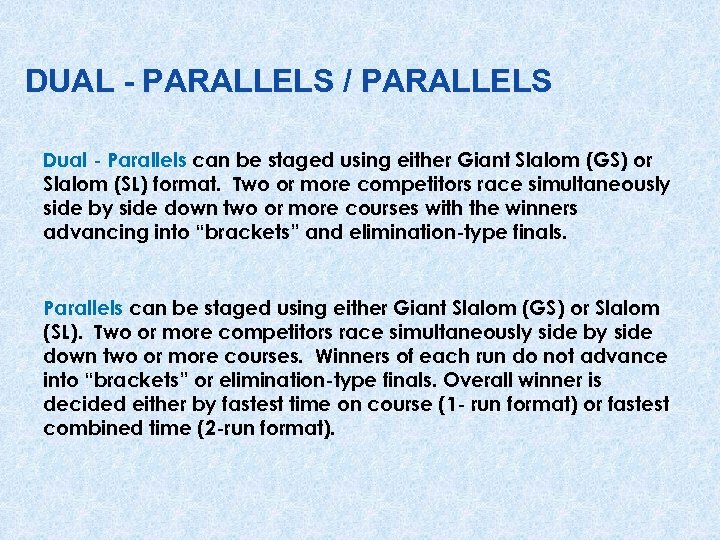 Two or more competitors race simultaneously side by side down two or more courses with the winners advancing into “brackets” and elimination-type finals. 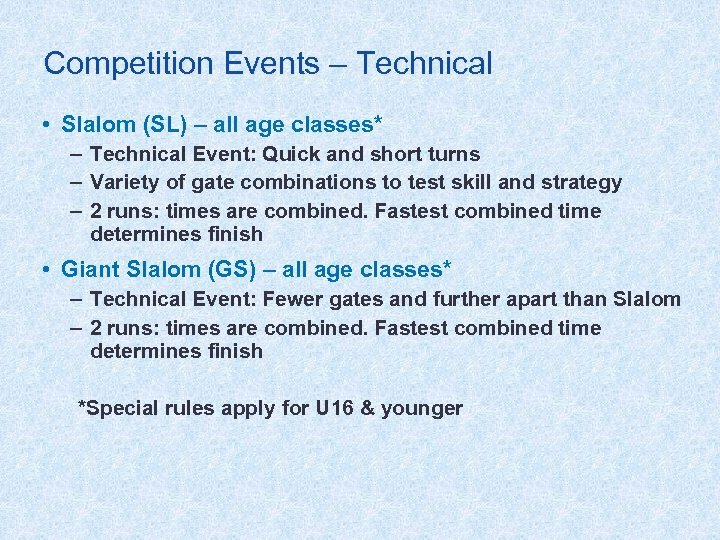 Parallels can be staged using either Giant Slalom (GS) or Slalom (SL). Two or more competitors race simultaneously side by side down two or more courses. 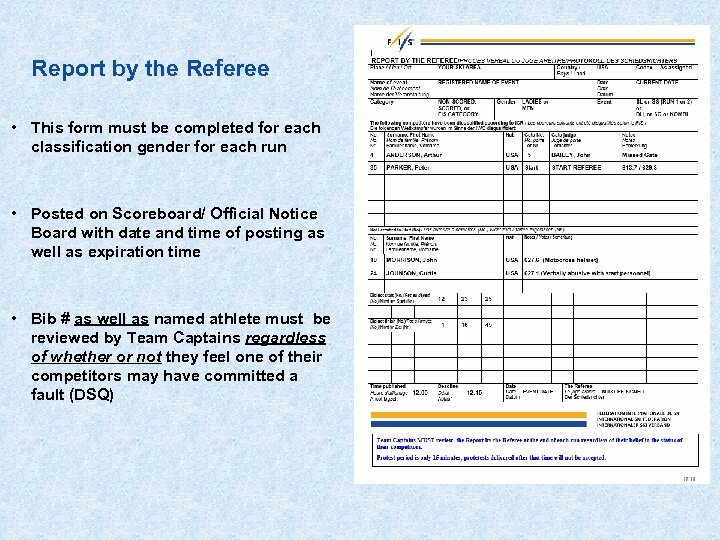 Winners of each run do not advance into “brackets” or elimination-type finals. 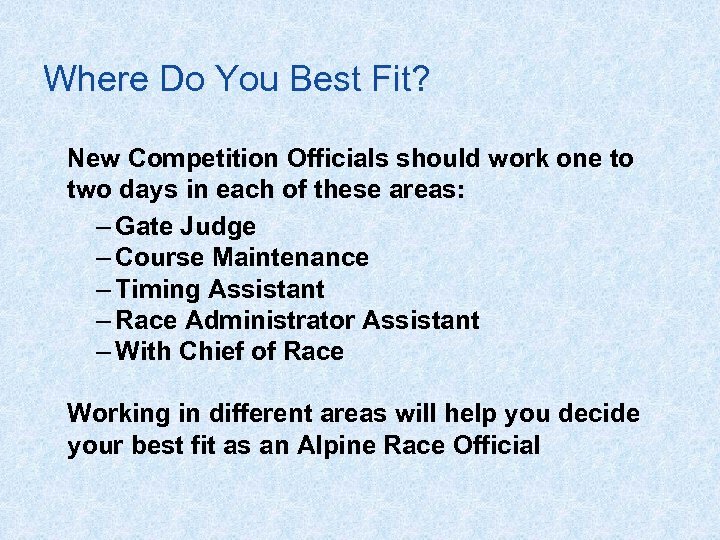 Overall winner is decided either by fastest time on course (1 - run format) or fastest combined time (2 -run format). 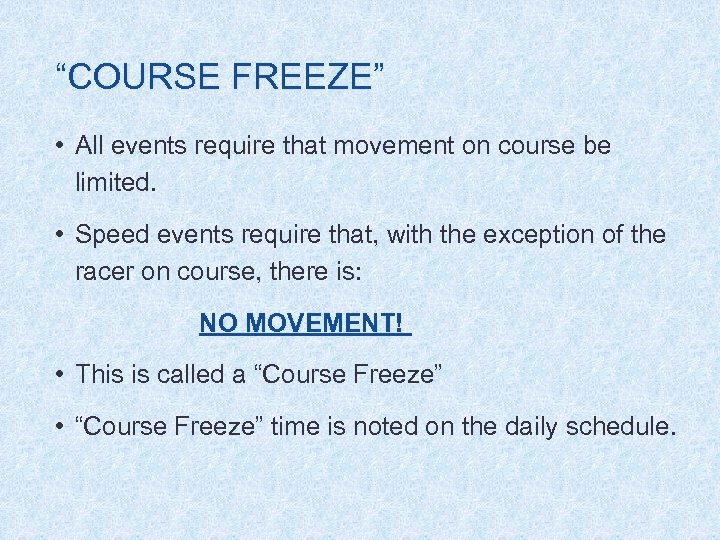 “COURSE FREEZE” • All events require that movement on course be limited. 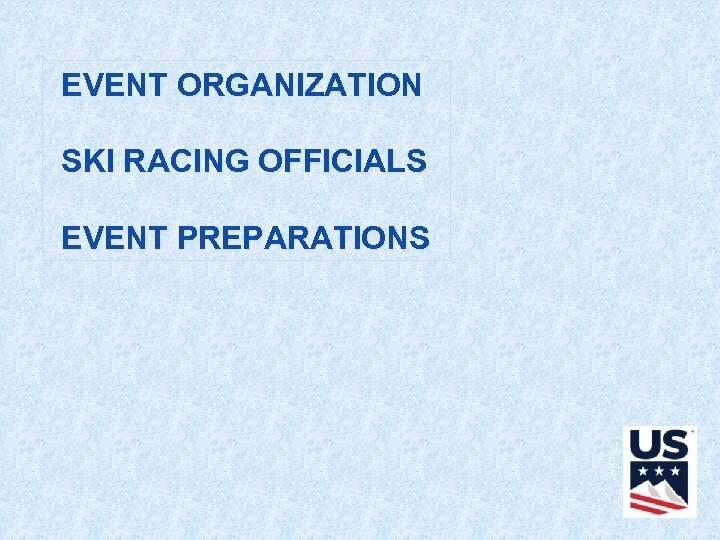 • Speed events require that, with the exception of the racer on course, there is: NO MOVEMENT! 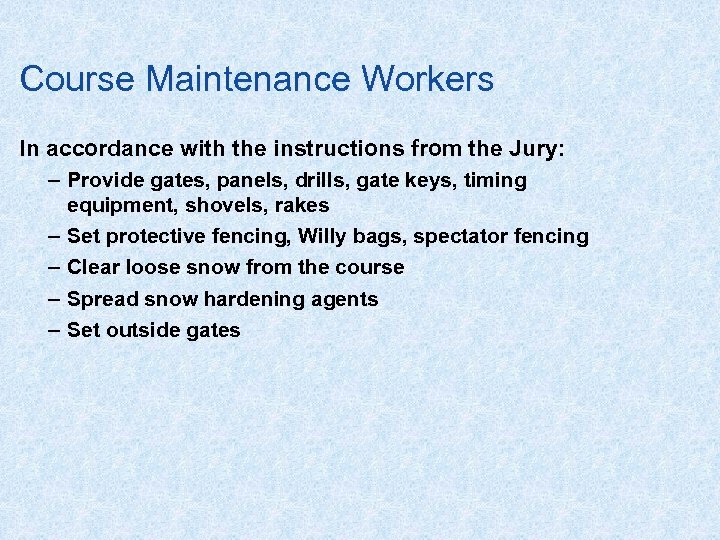 • This is called a “Course Freeze” • “Course Freeze” time is noted on the daily schedule. What are “Points”? 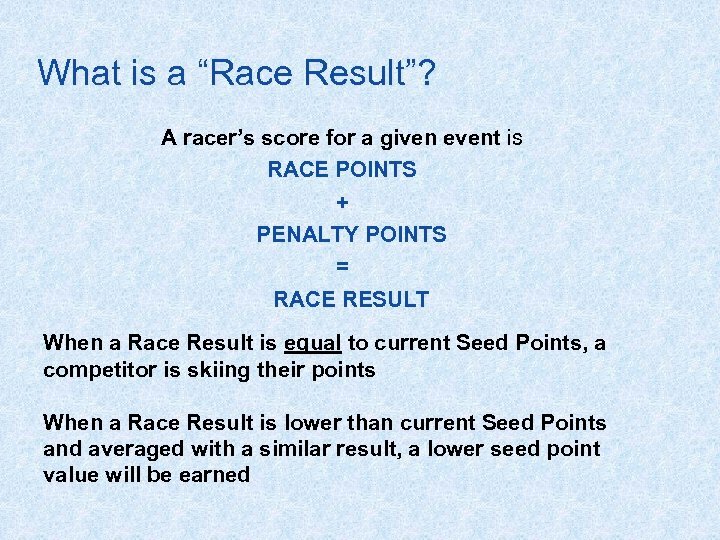 SEED POINTS: Calculation based on competitor’s prior results and indicating their standing among other competitors in an event; 0. 00 is the best and 999. 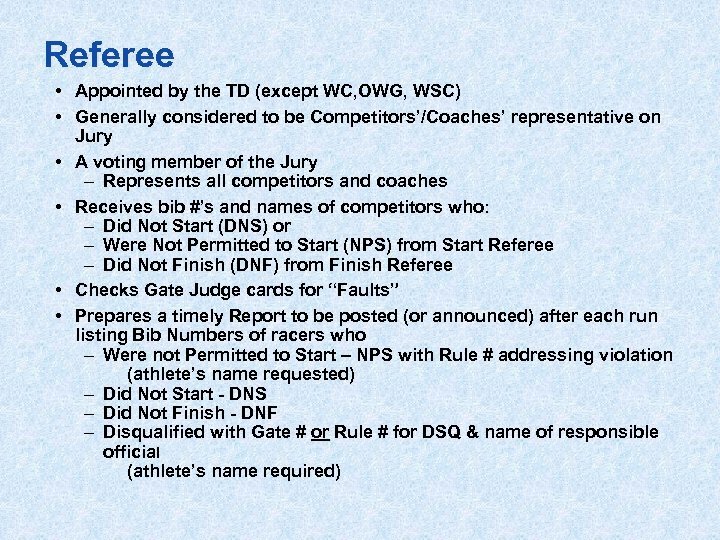 99* is assigned to competitors new to the seeding system. 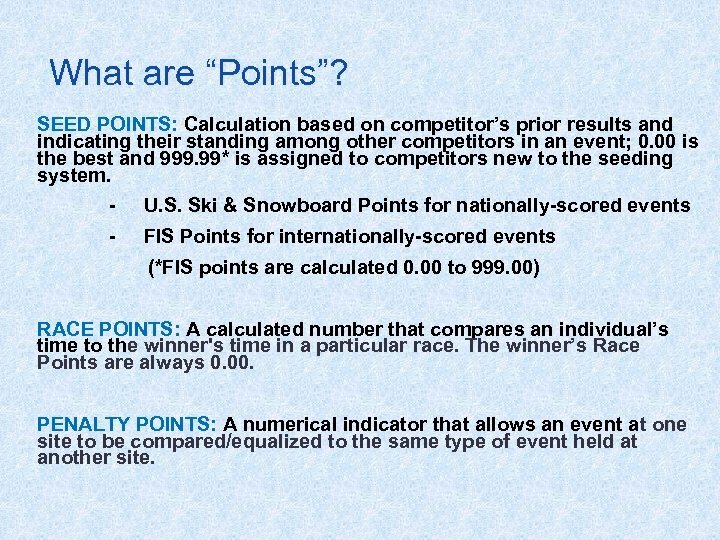 - U. S. Ski & Snowboard Points for nationally-scored events - FIS Points for internationally-scored events (*FIS points are calculated 0. 00 to 999. 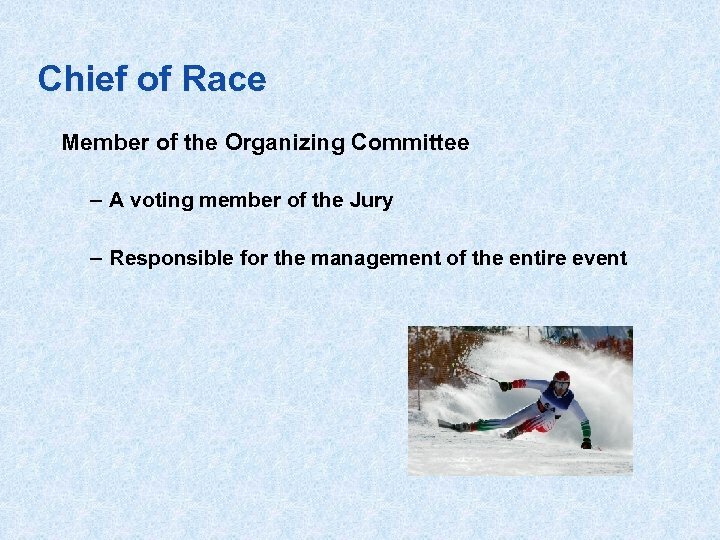 00) RACE POINTS: A calculated number that compares an individual’s time to the winner's time in a particular race. 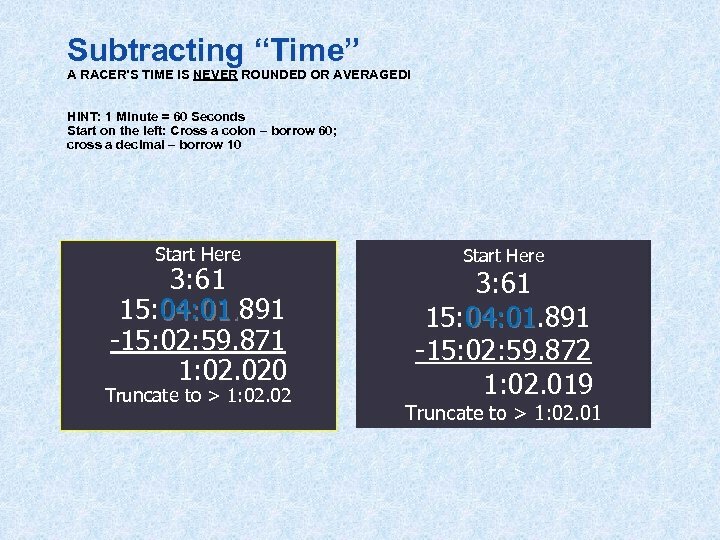 The winner’s Race Points are always 0. 00. 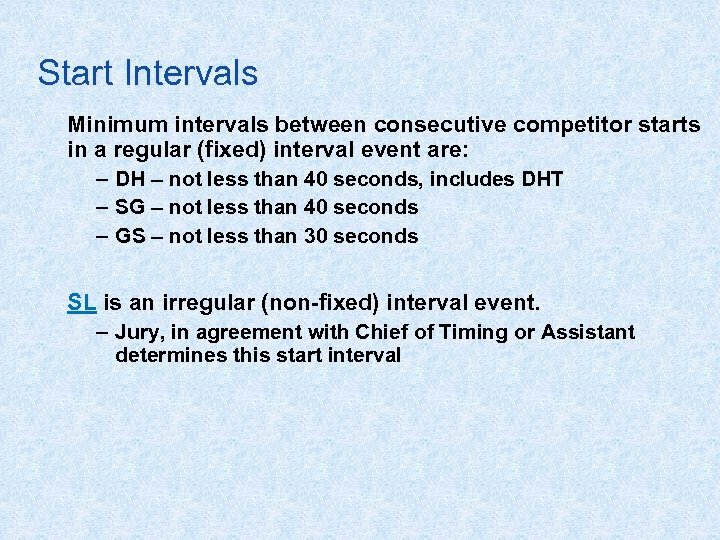 PENALTY POINTS: A numerical indicator that allows an event at one site to be compared/equalized to the same type of event held at another site. 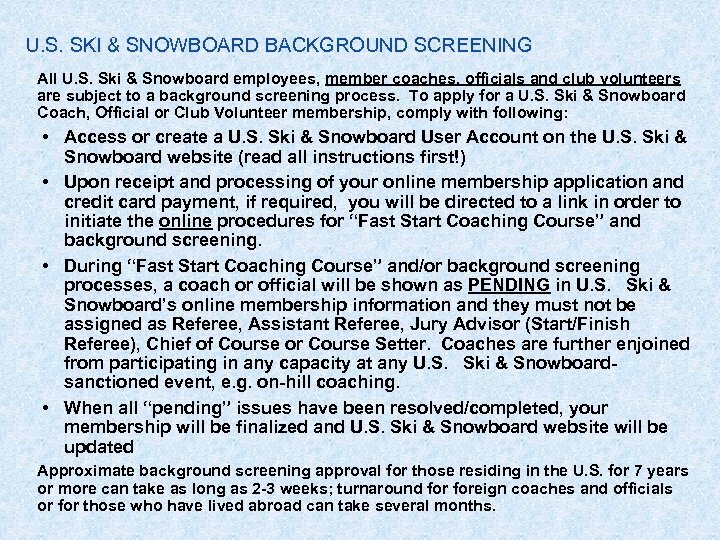 U. S. SKI & SNOWBOARD BACKGROUND SCREENING All U. S. Ski & Snowboard employees, member coaches, officials and club volunteers are subject to a background screening process. 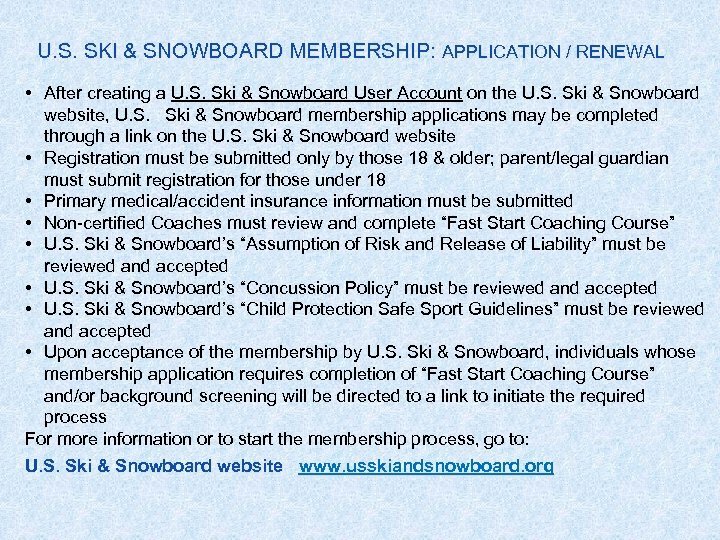 To apply for a U. S. Ski & Snowboard Coach, Official or Club Volunteer membership, comply with following: • Access or create a U. S. Ski & Snowboard User Account on the U. S. Ski & Snowboard website (read all instructions first!) 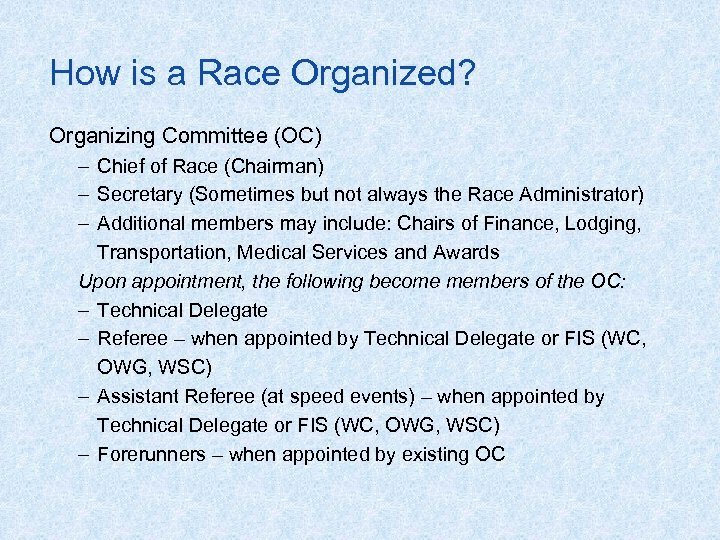 • Upon receipt and processing of your online membership application and credit card payment, if required, you will be directed to a link in order to initiate the online procedures for “Fast Start Coaching Course” and background screening. 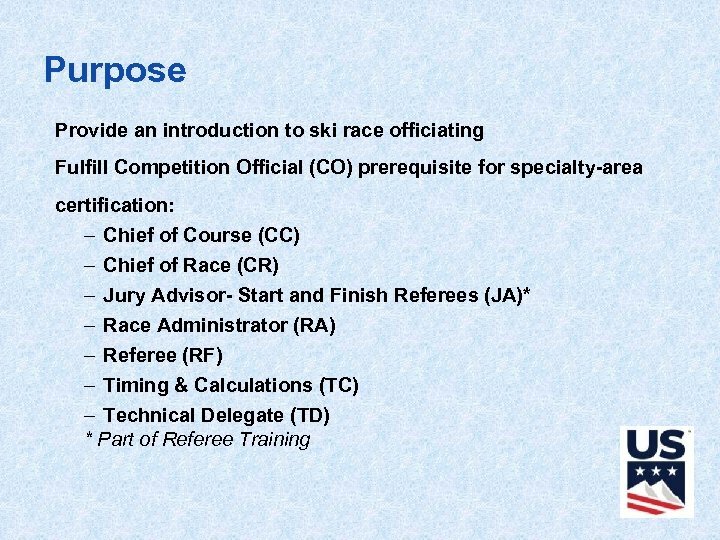 • During “Fast Start Coaching Course” and/or background screening processes, a coach or official will be shown as PENDING in U. S. Ski & Snowboard’s online membership information and they must not be assigned as Referee, Assistant Referee, Jury Advisor (Start/Finish Referee), Chief of Course or Course Setter. 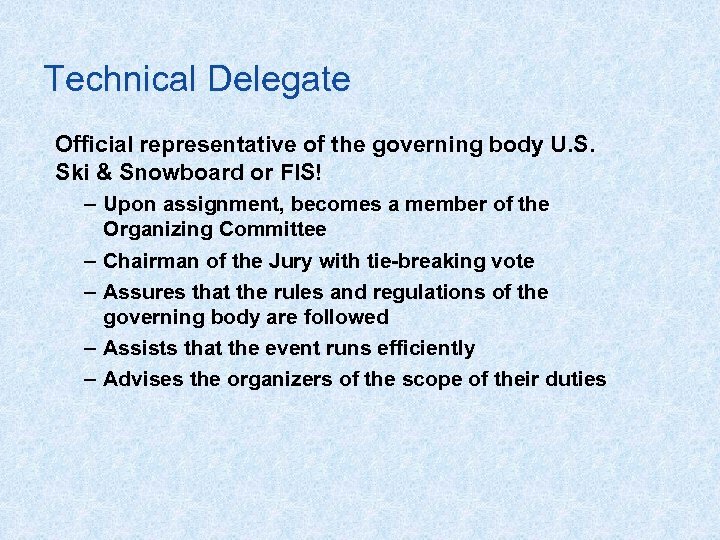 Coaches are further enjoined from participating in any capacity at any U. S. Ski & Snowboardsanctioned event, e. g. on-hill coaching. 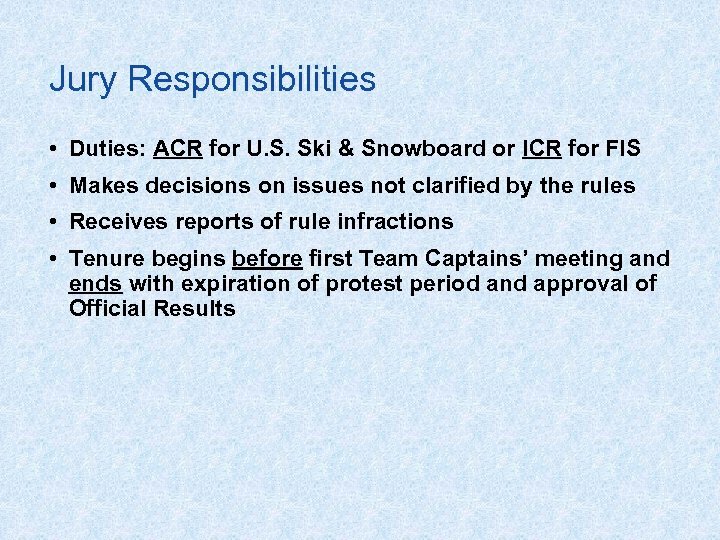 • When all “pending” issues have been resolved/completed, your membership will be finalized and U. S. Ski & Snowboard website will be updated Approximate background screening approval for those residing in the U. S. for 7 years or more can take as long as 2 -3 weeks; turnaround foreign coaches and officials or for those who have lived abroad can take several months. 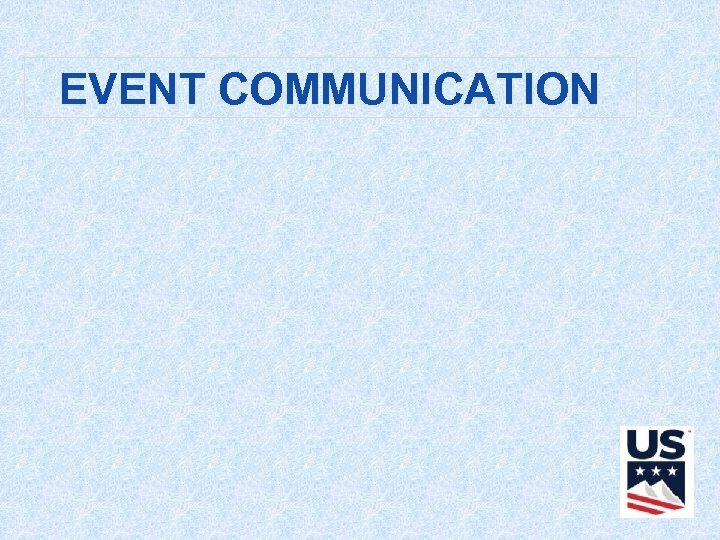 WHAT IS A CONNECTION COACH? 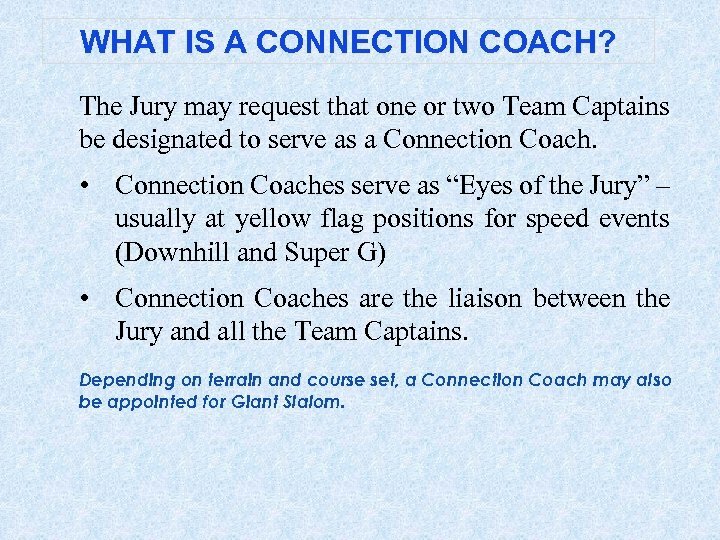 The Jury may request that one or two Team Captains be designated to serve as a Connection Coach. 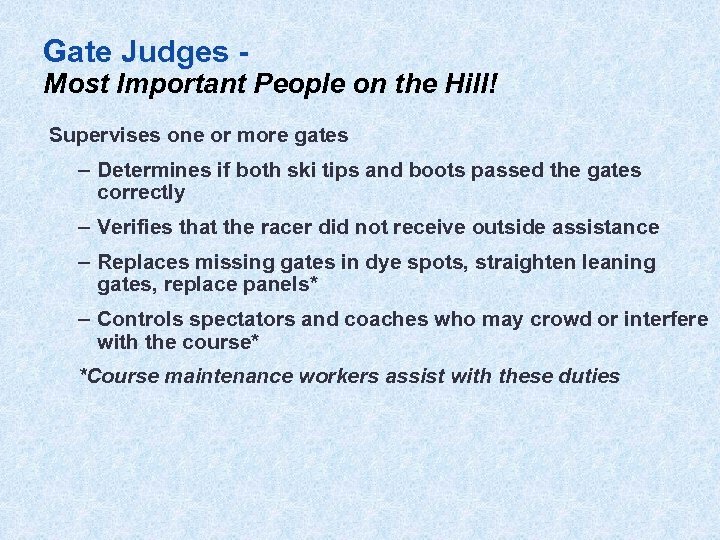 • Connection Coaches serve as “Eyes of the Jury” – usually at yellow flag positions for speed events (Downhill and Super G) • Connection Coaches are the liaison between the Jury and all the Team Captains. 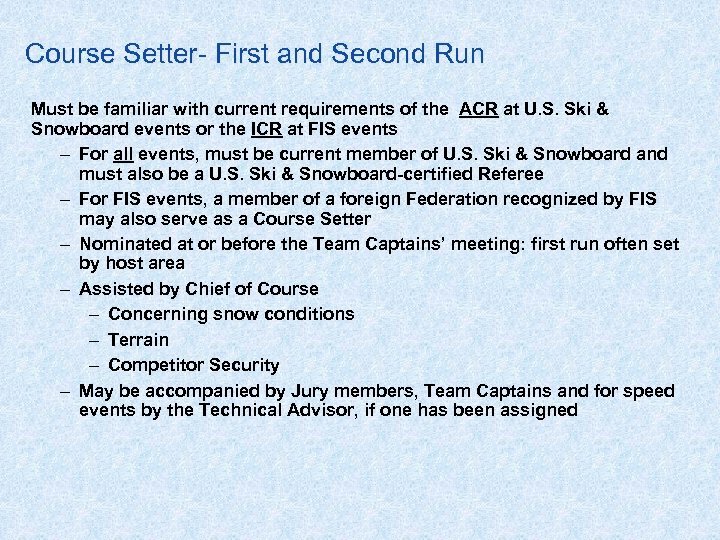 Depending on terrain and course set, a Connection Coach may also be appointed for Giant Slalom. 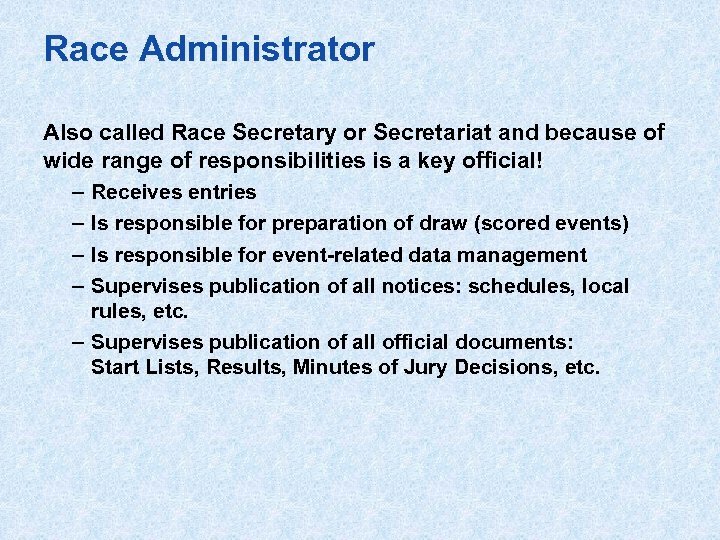 Race Administrator Also called Race Secretary or Secretariat and because of wide range of responsibilities is a key official! 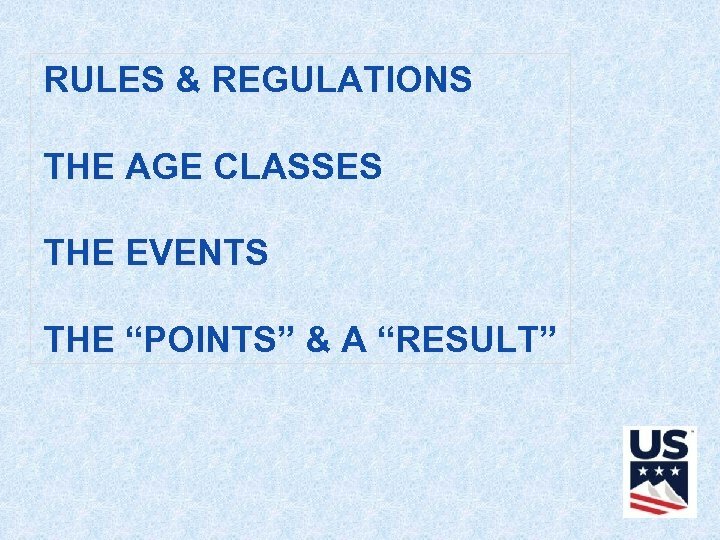 – – Receives entries Is responsible for preparation of draw (scored events) Is responsible for event-related data management Supervises publication of all notices: schedules, local rules, etc. 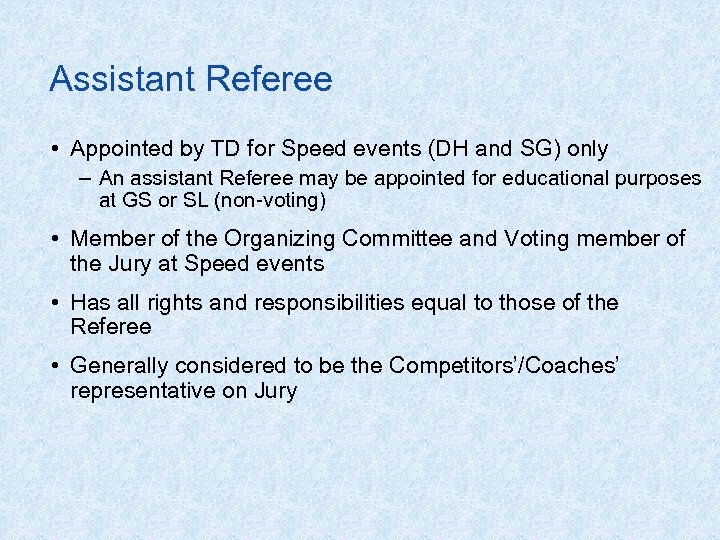 – Supervises publication of all official documents: Start Lists, Results, Minutes of Jury Decisions, etc. 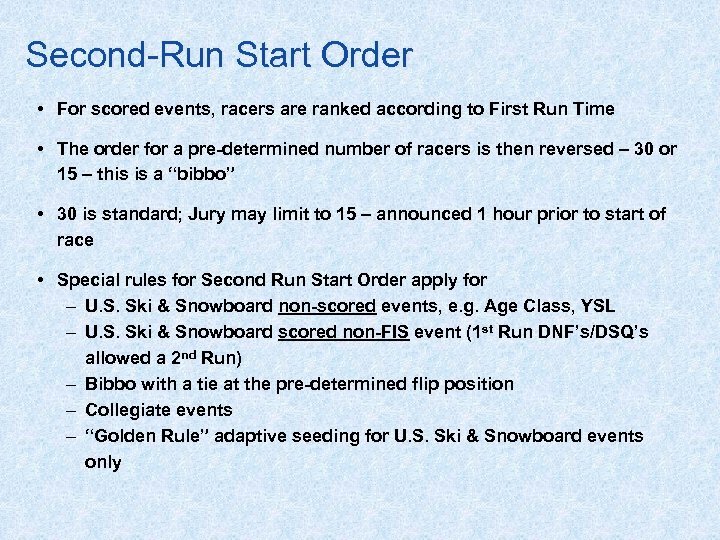 First- Run Start Order There are two categories of races: scored and non-scored. 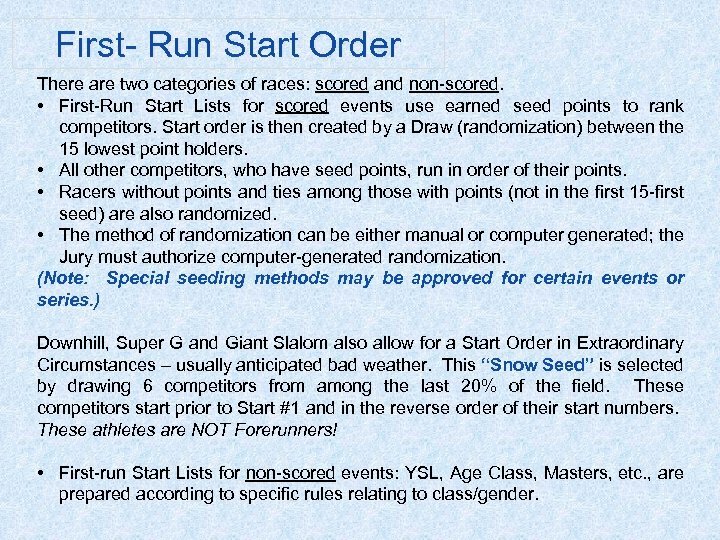 • First-Run Start Lists for scored events use earned seed points to rank competitors. 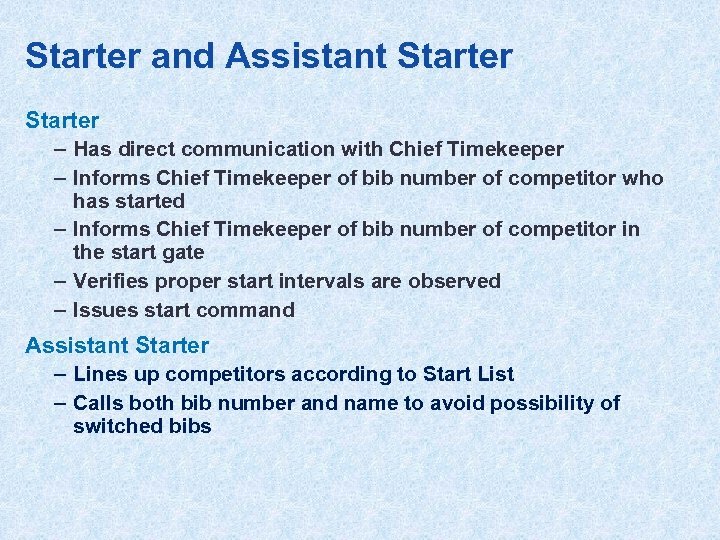 Start order is then created by a Draw (randomization) between the 15 lowest point holders. 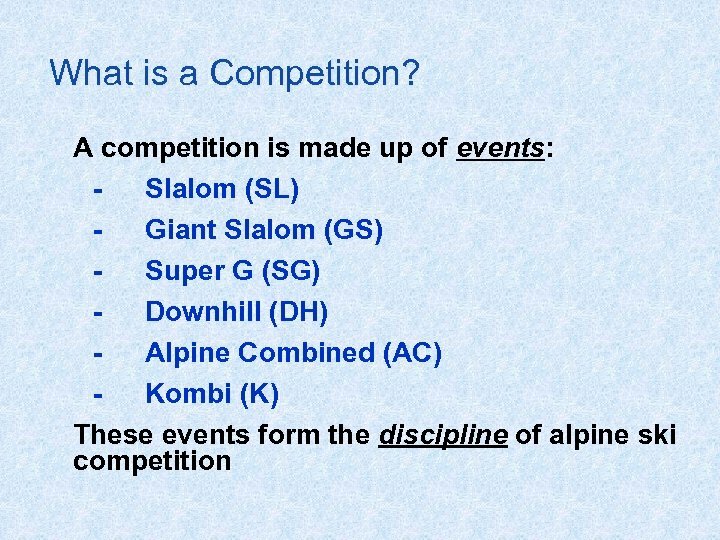 • All other competitors, who have seed points, run in order of their points. • Racers without points and ties among those with points (not in the first 15 -first seed) are also randomized. 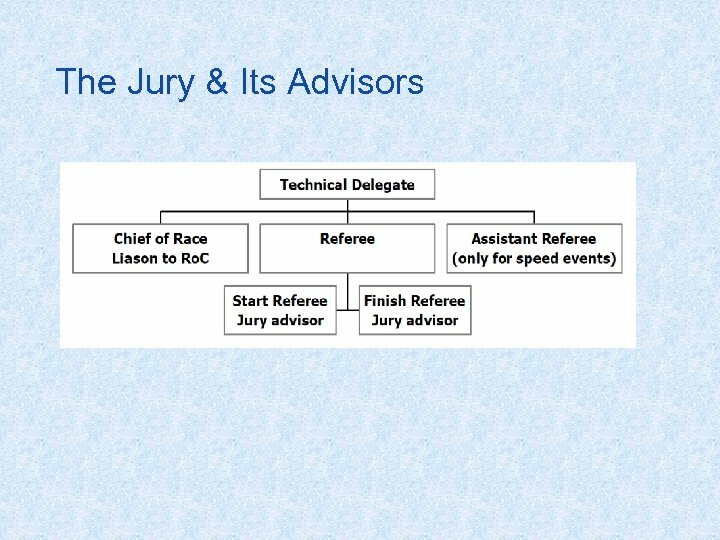 • The method of randomization can be either manual or computer generated; the Jury must authorize computer-generated randomization. 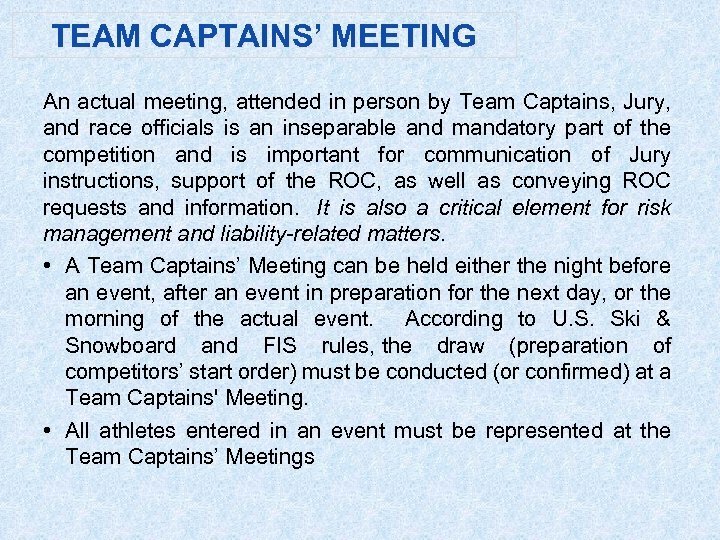 (Note: Special seeding methods may be approved for certain events or series. ) 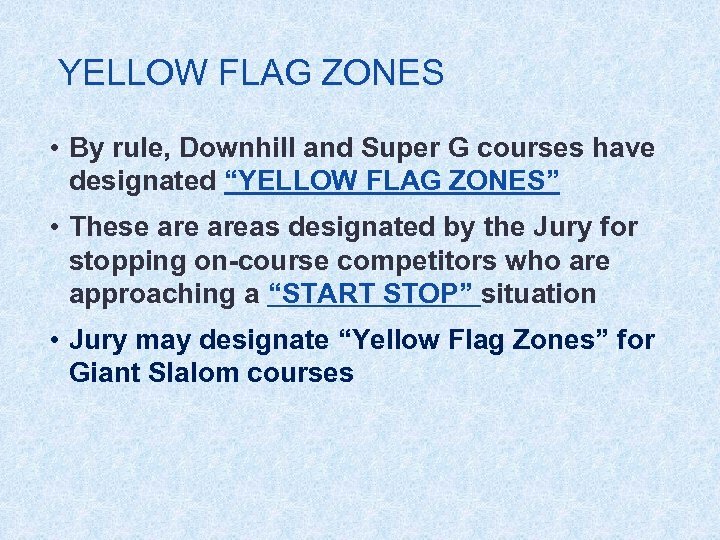 Downhill, Super G and Giant Slalom also allow for a Start Order in Extraordinary Circumstances – usually anticipated bad weather. 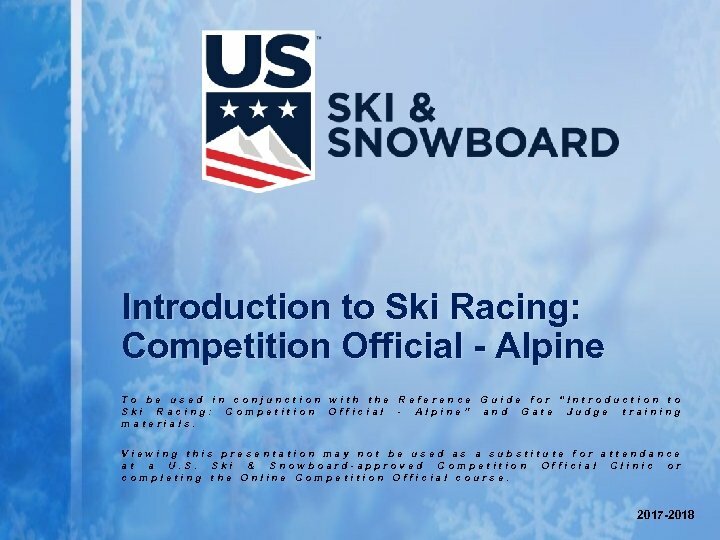 This “Snow Seed” is selected by drawing 6 competitors from among the last 20% of the field. 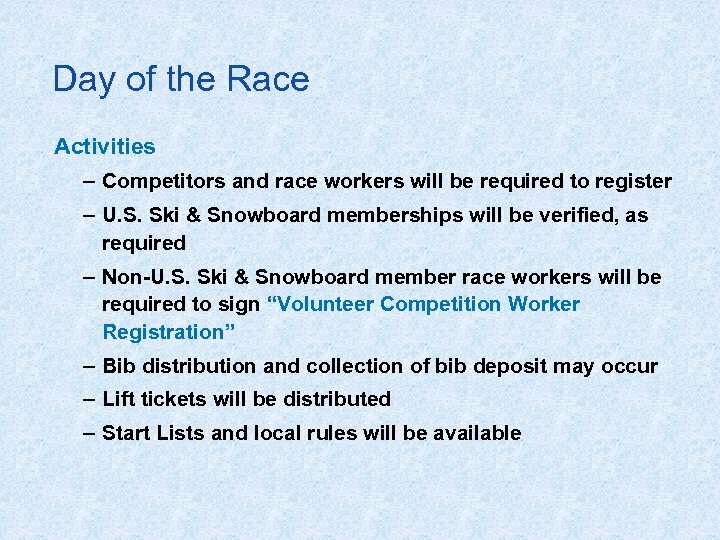 These competitors start prior to Start #1 and in the reverse order of their start numbers. 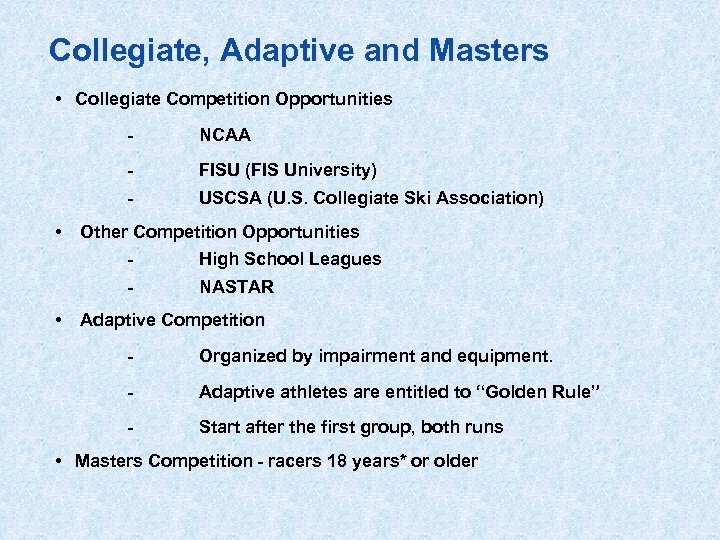 These athletes are NOT Forerunners! 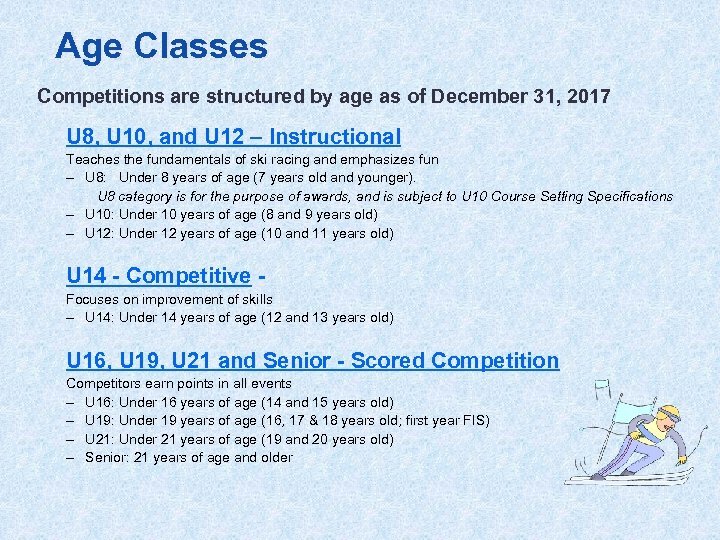 • First-run Start Lists for non-scored events: YSL, Age Class, Masters, etc. 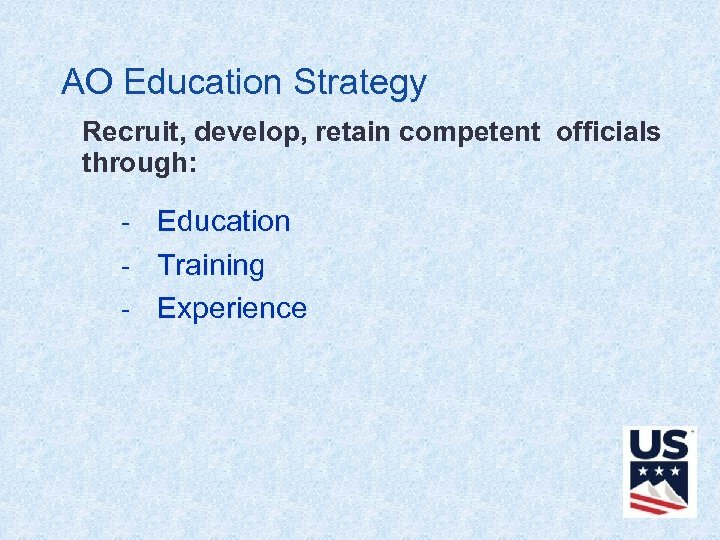 , are prepared according to specific rules relating to class/gender. 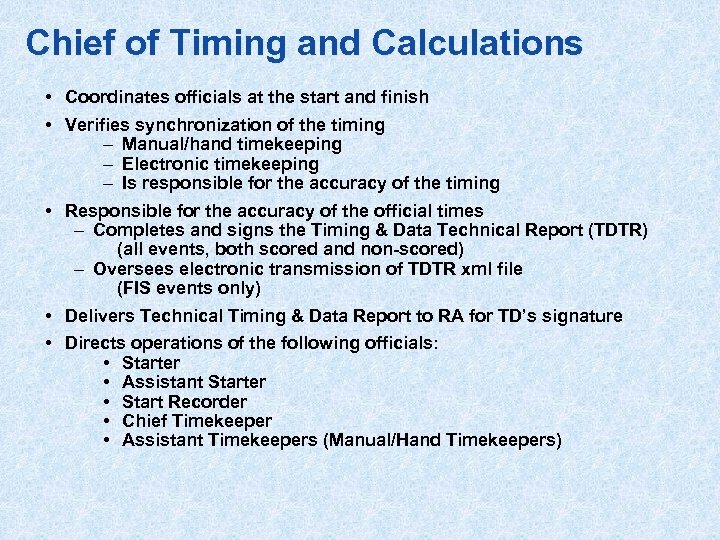 TIMEKEEPING • In order to provide manual backup in case of failure of the electronic timing system(s), both U. S. Ski & Snowboard and FIS require that time-of-day manual/hand times that are completely separate and independent of the electronic timing be recorded for the individual competitors both when they leave the start and when they arrive at the finish. 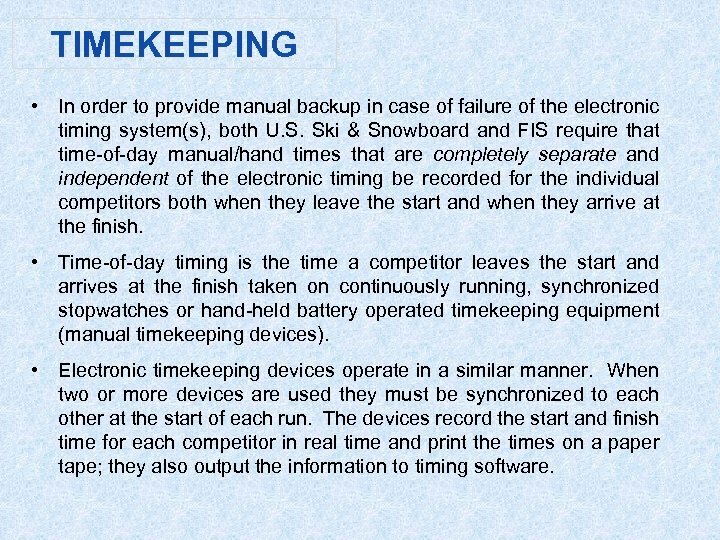 • Time-of-day timing is the time a competitor leaves the start and arrives at the finish taken on continuously running, synchronized stopwatches or hand-held battery operated timekeeping equipment (manual timekeeping devices). 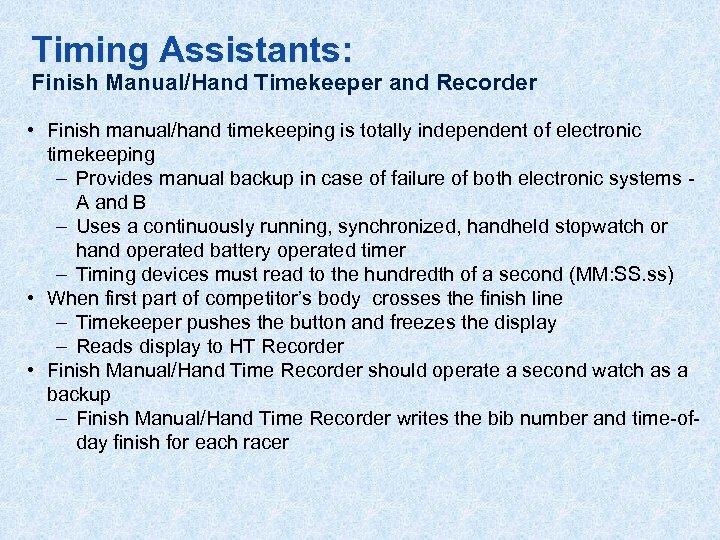 • Electronic timekeeping devices operate in a similar manner. 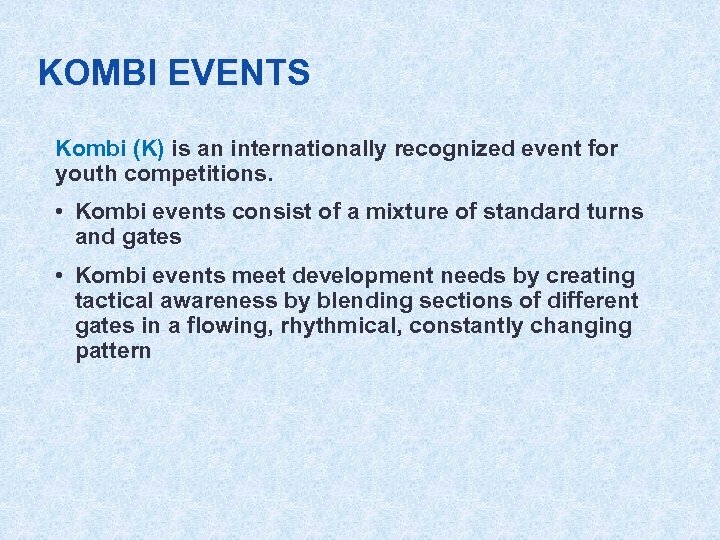 When two or more devices are used they must be synchronized to each other at the start of each run. 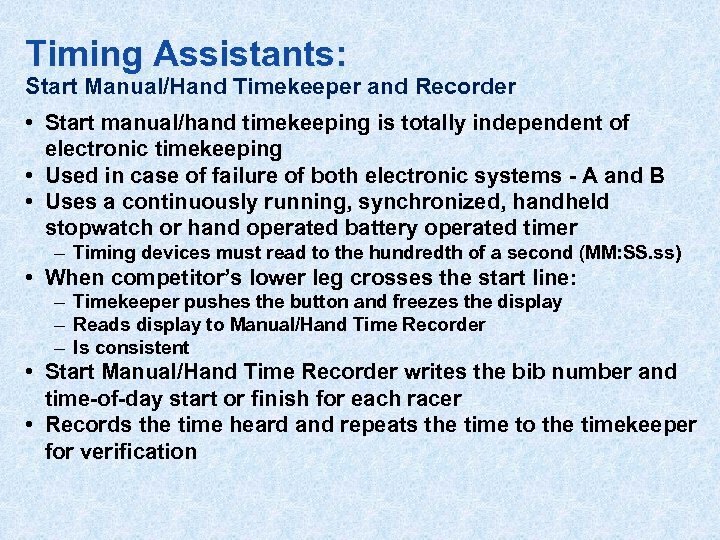 The devices record the start and finish time for each competitor in real time and print the times on a paper tape; they also output the information to timing software. 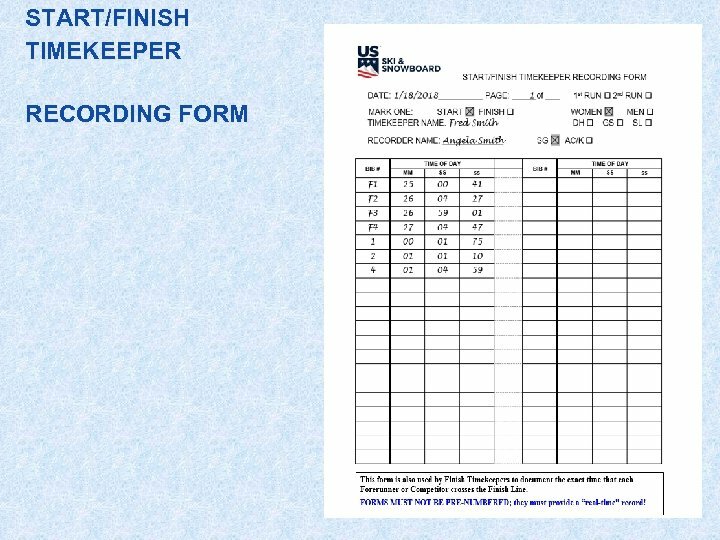 START / FINISH TIMEKEEPER RECORDING FORM START TIMEKEEPER: Obtains/records a manual time for all competitors who start. 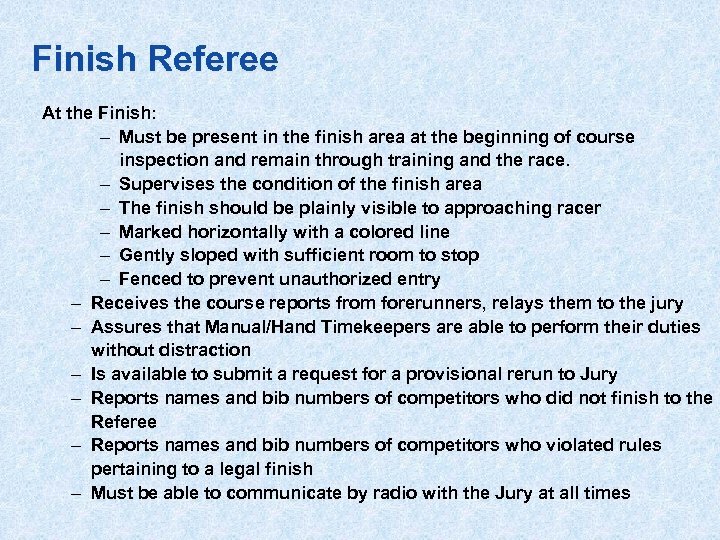 FINISH TIMEKEEPER: Obtains/records a manual time for all competitors who cross the finish line. 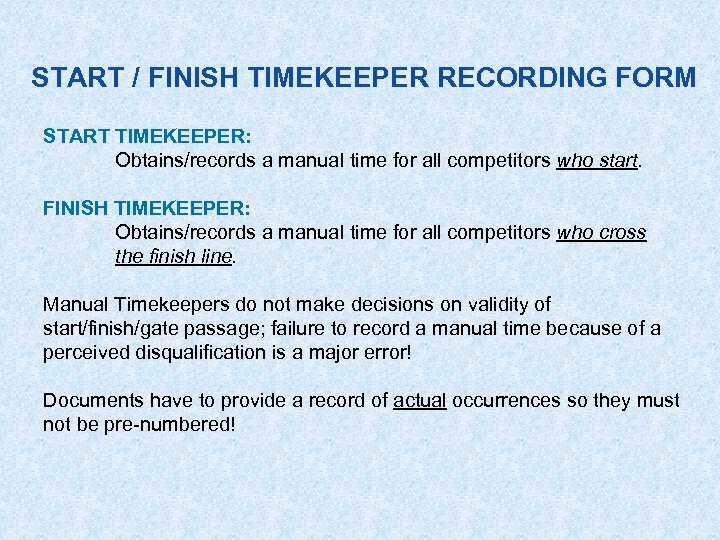 Manual Timekeepers do not make decisions on validity of start/finish/gate passage; failure to record a manual time because of a perceived disqualification is a major error! 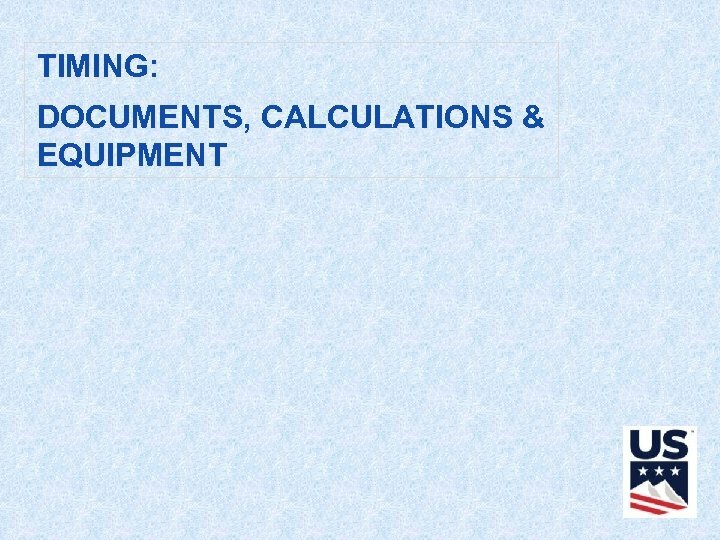 Documents have to provide a record of actual occurrences so they must not be pre-numbered! 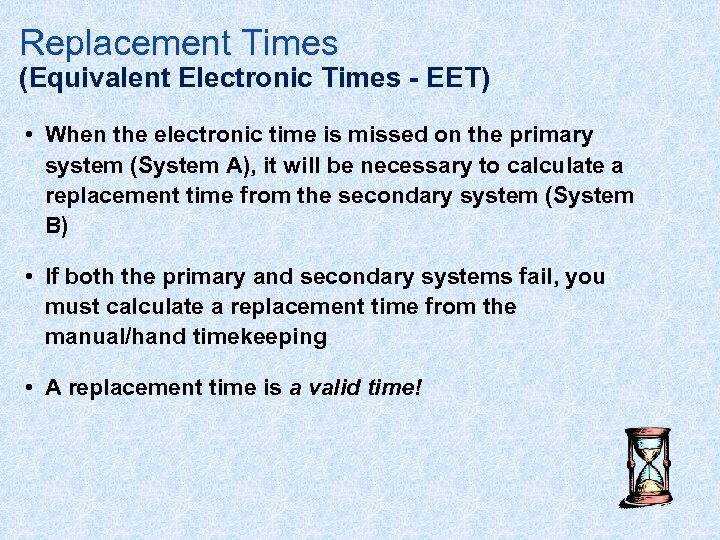 Replacement Times (Equivalent Electronic Times - EET) • When the electronic time is missed on the primary system (System A), it will be necessary to calculate a replacement time from the secondary system (System B) • If both the primary and secondary systems fail, you must calculate a replacement time from the manual/hand timekeeping • A replacement time is a valid time! 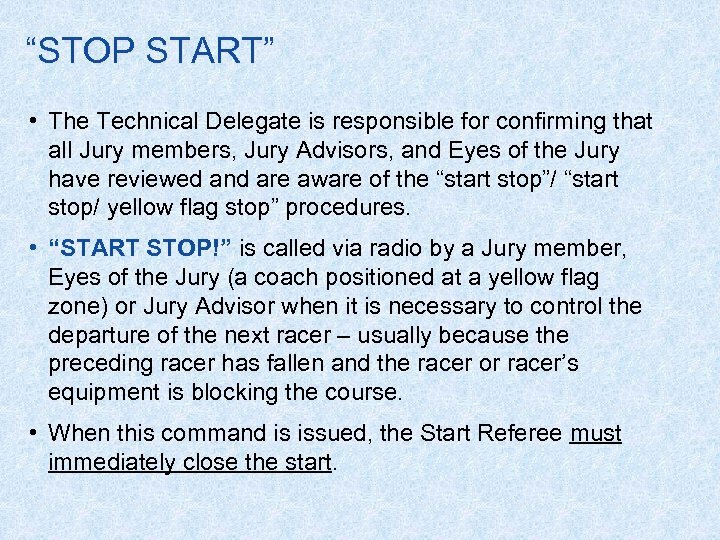 “STOP START” • The Technical Delegate is responsible for confirming that all Jury members, Jury Advisors, and Eyes of the Jury have reviewed and are aware of the “start stop”/ “start stop/ yellow flag stop” procedures. 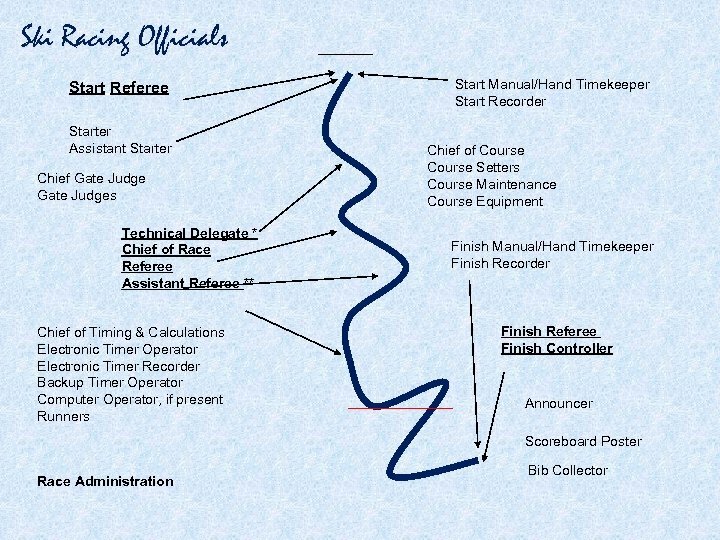 • “START STOP!” is called via radio by a Jury member, Eyes of the Jury (a coach positioned at a yellow flag zone) or Jury Advisor when it is necessary to control the departure of the next racer – usually because the preceding racer has fallen and the racer or racer’s equipment is blocking the course. 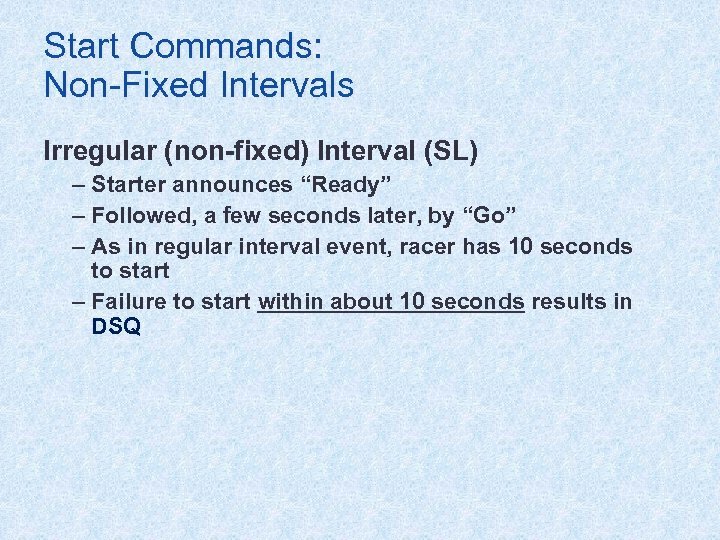 • When this command is issued, the Start Referee must immediately close the start. 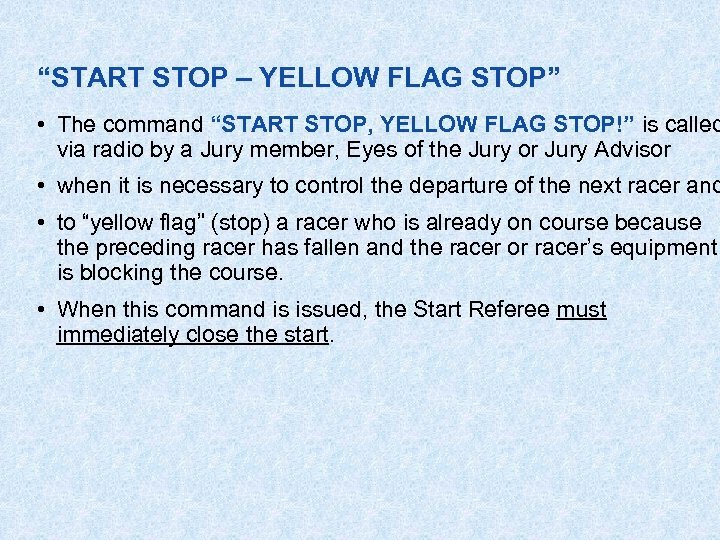 “START STOP – YELLOW FLAG STOP” • The command “START STOP, YELLOW FLAG STOP!” is called via radio by a Jury member, Eyes of the Jury or Jury Advisor • when it is necessary to control the departure of the next racer and • to “yellow flag” (stop) a racer who is already on course because the preceding racer has fallen and the racer or racer’s equipment is blocking the course. 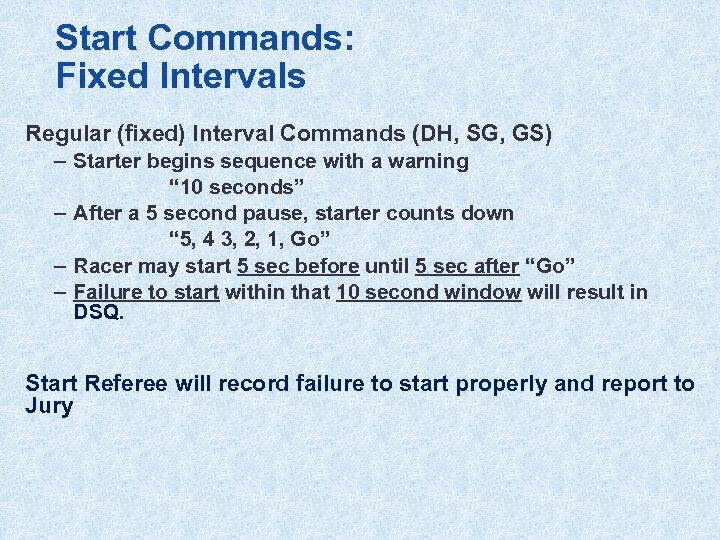 • When this command is issued, the Start Referee must immediately close the start. 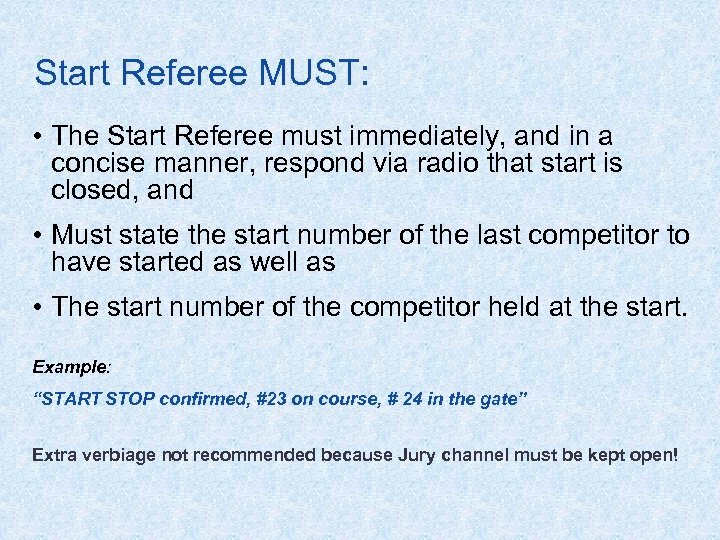 Start Referee MUST: • The Start Referee must immediately, and in a concise manner, respond via radio that start is closed, and • Must state the start number of the last competitor to have started as well as • The start number of the competitor held at the start. 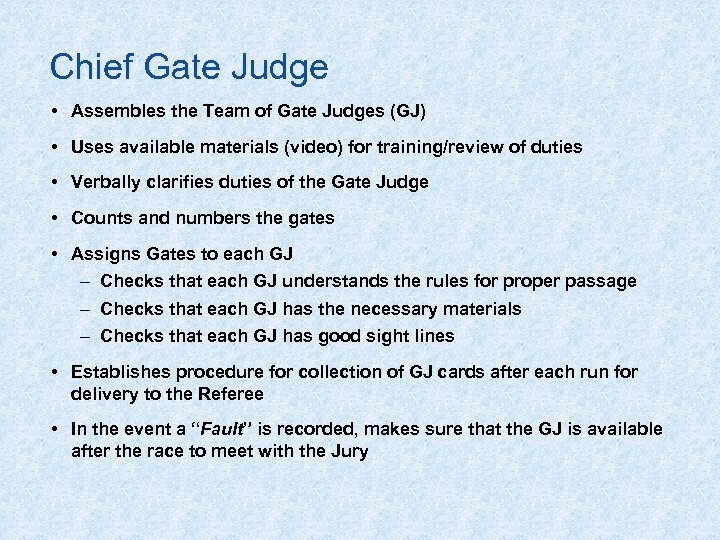 Example: “START STOP confirmed, #23 on course, # 24 in the gate” Extra verbiage not recommended because Jury channel must be kept open! 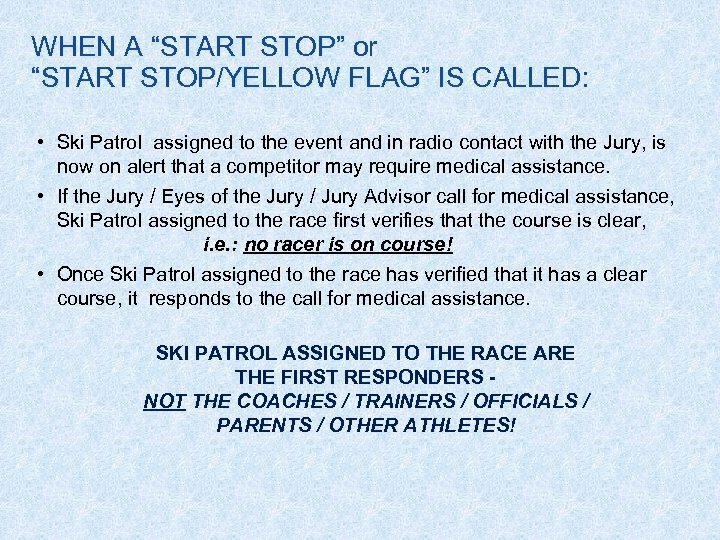 WHEN A “START STOP” or “START STOP/YELLOW FLAG” IS CALLED: “START STOP/YELLOW FLAG” IS CALLED • Ski Patrol assigned to the event and in radio contact with the Jury, is now on alert that a competitor may require medical assistance. 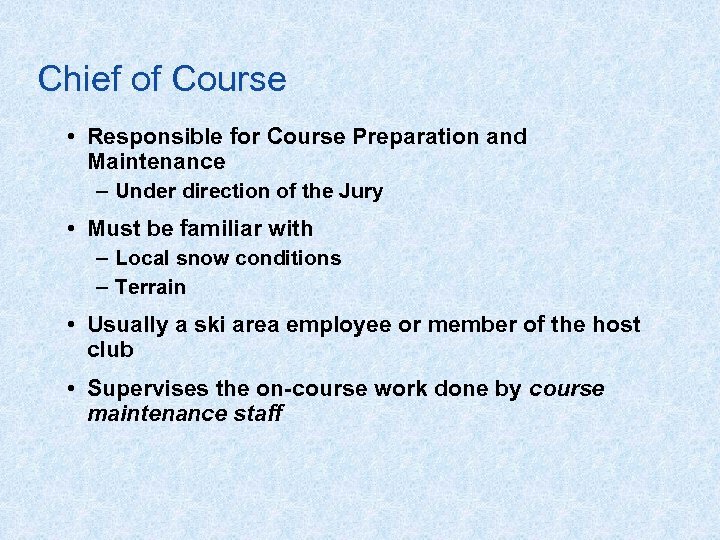 • If the Jury / Eyes of the Jury / Jury Advisor call for medical assistance, Ski Patrol assigned to the race first verifies that the course is clear, i. e. : no racer is on course! 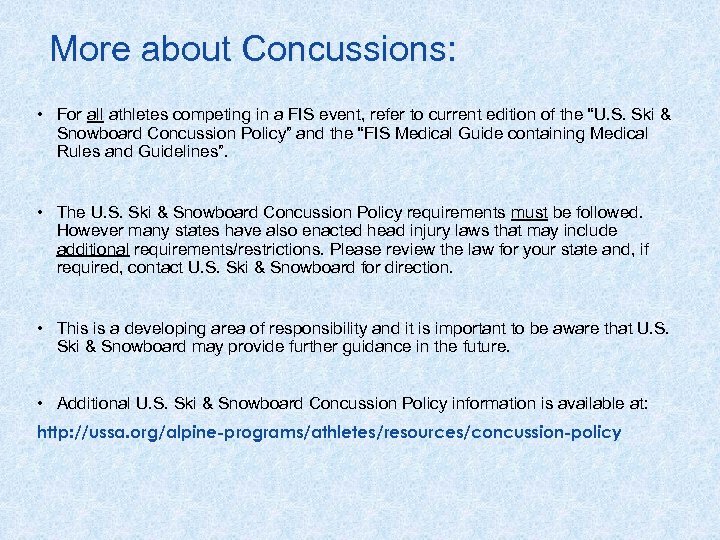 • Once Ski Patrol assigned to the race has verified that it has a clear course, it responds to the call for medical assistance. 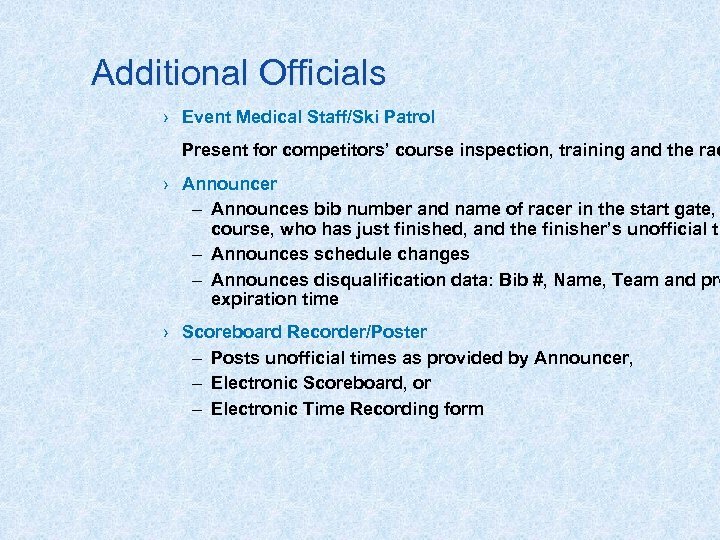 SKI PATROL ASSIGNED TO THE RACE ARE THE FIRST RESPONDERS NOT THE COACHES / TRAINERS / OFFICIALS / PARENTS / OTHER ATHLETES! 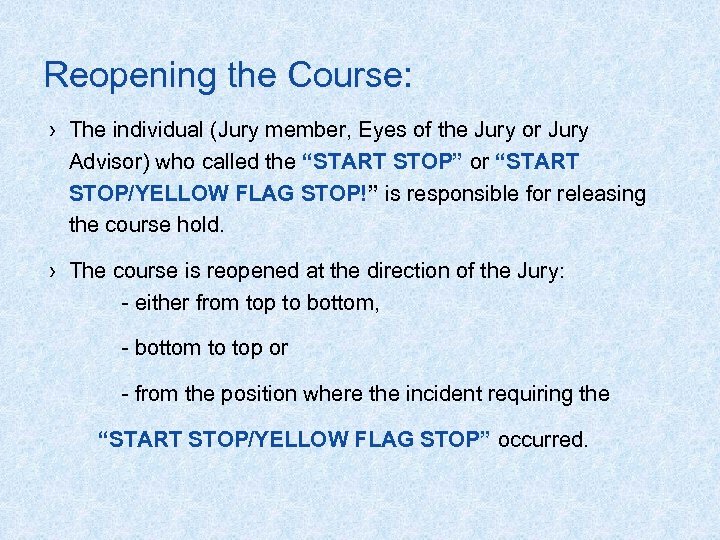 Reopening the Course: › The individual (Jury member, Eyes of the Jury or Jury Advisor) who called the “START STOP” or “START STOP/YELLOW FLAG STOP!” is responsible for releasing the course hold. 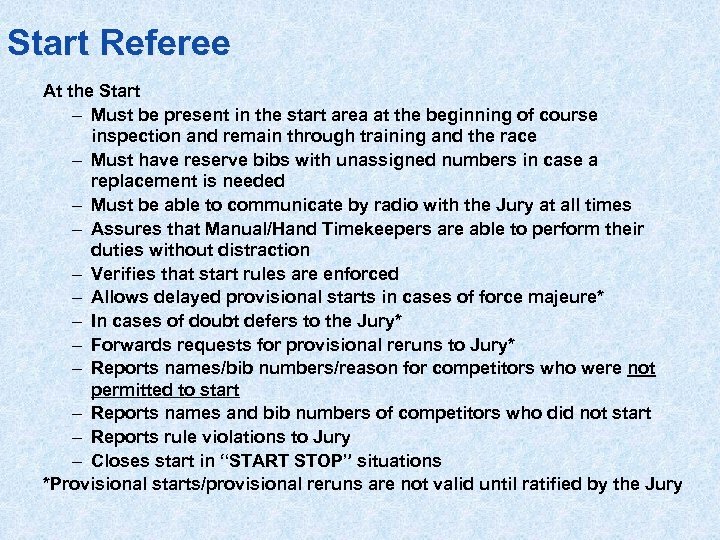 › The course is reopened at the direction of the Jury: - either from top to bottom, - bottom to top or - from the position where the incident requiring the “START STOP/YELLOW FLAG STOP” occurred. 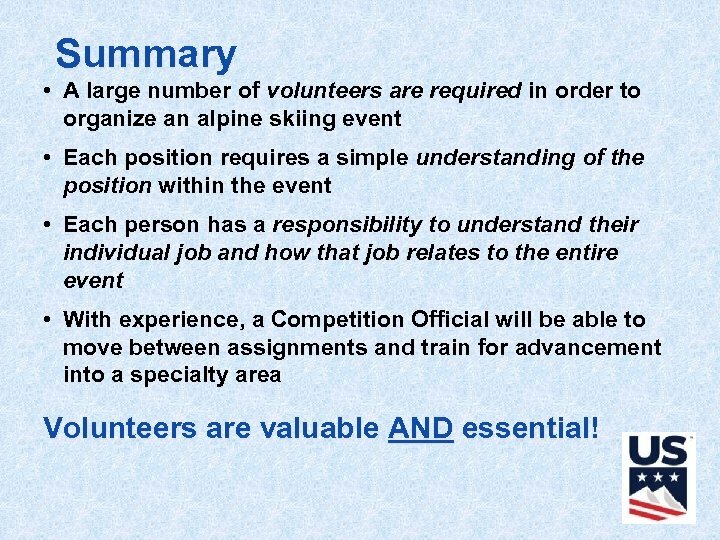 Summary • A large number of volunteers are required in order to organize an alpine skiing event • Each position requires a simple understanding of the position within the event • Each person has a responsibility to understand their individual job and how that job relates to the entire event • With experience, a Competition Official will be able to move between assignments and train for advancement into a specialty area Volunteers are valuable AND essential!